American industrialist. Although born in Leeds (England), the son of a temporarily displaced millwright, Dickson was raised in Lauder in the Scottish Borders, which was the home of his parents, and he certainly regarded his roots as Scottish. He left with his family for Canada in 1832, but the family soon moved to Carbondale (Pennsylvania, USA), where the young Dickson completed his education. He began his career as a mule driver in the mines at Carbondale, but soon co-founded a family business in Scranton (the Dickson Manufacturing Company) which went on to make boilers, steam engines and steam locomotives, becoming its President by 1856. Dickson developed a range of business interests, including General Superintendent of the Delaware and Hudson Canal Company (1860), which by this time had diversified into railways. 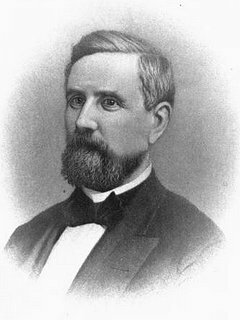 He became President of that company from 1869, and was also a founder of the Moosic Powder Company and a Director of the First National Bank of Scranton. Dickson died in Morristown (New Jersey) and is buried in Dunmore Cemetery in Pennsylvania. The nearby Dickson City is named in his honour and the Scranton Cultural Center now occupies the site of his home in Scranton.